We coordinate policy and guidance to support and advance research at UC. 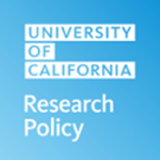 Check out UC Research Policy on Twitter. Sponsored project award and proposal data and UC research in the news.